As I was camping the Colorado Plateau to see the arches, plateaus, buttes, mesas, canyons, hoodoos, and caves of God's country, I decided my tour of the great southwest would not be complete until I had read, cover to cover, a true fist-fighting, gun-slinging, horse-riding, cowboy-hat-wearing, western novel, so I strode into Goulding's Trading Post in Monument Valley to find one as tough as the jerky I had eaten for lunch that day at a truck stop on the 160. I passed the turquoise jewelry, the handmade Navajo blankets, the silver belt buckles, and crossed to the bookshelf on the far wall. Indian drums pounded through the speakers over my head, and the sweet scent of frybread drifted in the door from the restaurant across the way as Larry McMurtry caught my eye. Here was a Pulitzer Prize winning novelist, surely his work would be worth reading. Just then Zane Grey distracted me. Wasn't Colonel Potter always reading Zane Gray novels on M*A*S*H? Wouldn't an old cavalry man know a good western? But as I moved down the shelf, I saw that most of the novels were written by a man I had often heard of but never read: it was finally time, I thought, to read a novel written by the bestselling Louis L'Amour. This novelist published over 120 books, 260 million of which are still in print around the world; his work has been translated into twenty languages, and at least forty-five of his stories have been made into television movies and feature films. In 1983, the United States Congress awarded L'Amour the Congressional Gold Medal, and, one year later, President Reagan honored the author with the Medal of Freedom. Clearly, many admire, even worship, the work of Louis L'Amour. 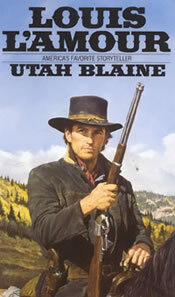 As I read the novel, I had chosen, Utah Blaine, I thought about why he was so staggeringly popular. In Louis L'Amour novels, we get a good story that follows the conventional narrative trajectory. No Faulknerian, postmodern, stream of consciousness confusion here. Just a simple story told simply. Secondly, the traditional western film evolved into a genre critics called the "adult western" in which the clear lines between good and evil were blurred. Students of our political history have also seen similar blurring. Slavery, Native American removal, the Civil War, the Korean War, the Vietnam War, among other events, have sickened and confused us. In Utah Blaine's world, good and evil still live in the separate provinces of black and white. No gray dims our moral vision. Lastly, Utah himself personifies the myth of the cowboy. Rugged, independent, tall, and strong, he can whip the biggest man in town in a fist fight, outdraw the most proficient gunmen, command employees, gather wealth, and win the heart of the fairest maiden. In short, he's the hero most men want to be, and most women want to marry. Feminists and the politically correct would probably not enjoy a novel like Utah Blaine, but for those of us who prefer not to wrestle our way though The Sound and the Fury or Paradise, for those of us who would like to avoid, if only for a couple of hours, American guilt, for those of us who long for a simple world devoid of postmodern confusion, a good Louis L'Amour and a vacation in the majestic Southwest is just what the doctor ordered.